When Steven and I arrived at the ranch last year in early November, we had no idea that it would be after Easter before we said our goodbyes and began our trek back to the northwest. We assumed we'd be on our way shortly after Christmas, boondocking in the desert southwest for several weeks before turning north. But my dental appointments kept us in the area far longer than we had anticipated. Though we would not have planned it this way, in the end, we realized how well it worked out and just how much more traveling we were able to do. With the ranch as our center of all things, we branched out in every direction possible. We had an amazing winter and early spring filled with new destinations, beautiful sights and unforgettable experiences. The icing on the cake was the time we got to spend with my family. All-in-all, it was just about perfect. Fun with Buzzy at the ranch and an aerial shot of the ranch with Scoopy. Steven and Tara did a fun photo shoot before she left. In between final appointments, we managed to get Scoopy's new water pump installed and put Tara on a plane back to San Diego. Just six days after returning to the ranch from our northern swing, we waved goodbye one more time to my parents and the dogs, Luke and Maddie. We will return to the ranch in November, but there is so much traveling to be done between now and then, and we were really excited to get going! Luke wishes he could go too. Tara heads home to San Diego. Earlier, when we had to cancel our plans to go boondocking with friends Clarke and Elaine Hockwald, we thought that opportunity was lost. 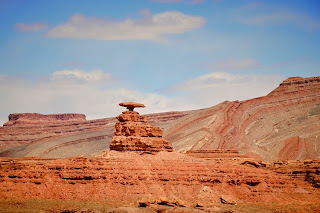 Then we realized with a little tweak to our schedule and a beeline out of Texas and through New Mexico, we could meet up for a couple of days of boondocking at Goosenecks State Park in southern Utah just outside a little town called Mexican Hat. 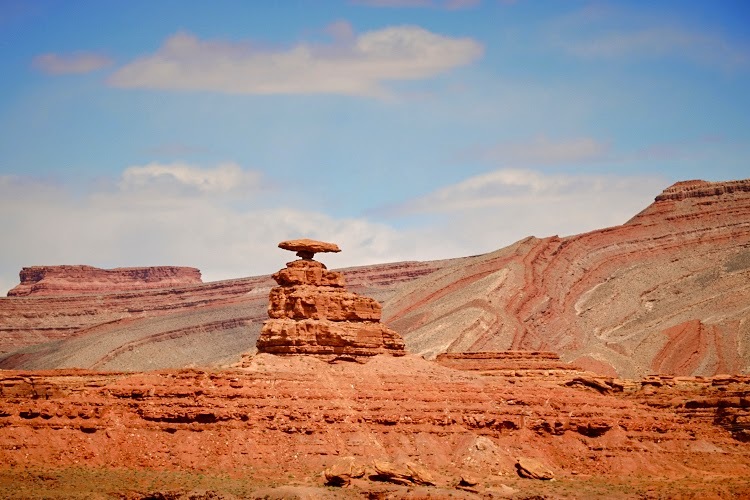 The rock(s) that give Mexican Hat its name. 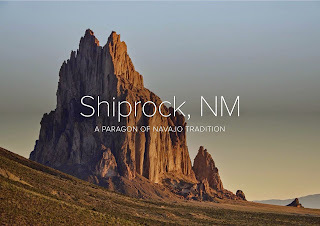 On the way to Goosenecks, we stayed one overnight in Santa Rosa, NM before moving on to Farmington, where we stayed a couple of nights so that Steven would have the opportunity to photograph the massive rock structure known as Shiprock. 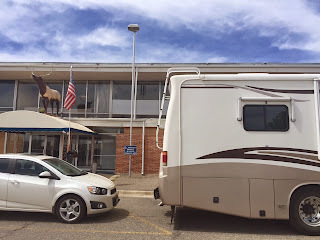 We stayed at the Elks Lodge in Farmington, which turned out to be kind of awesome. It's located high on a hill overlooking town, so if you get the front site, you get a great view. We couldn’t pass through Albuquerque without a stop at TJs. Wine, boo! Basil, yay! Scoopy arrives at the Elk's Lodge. Our awesome view in Farmington. Toadie approves of the view of Shiprock. A raven very kindly poses for his closeup with Shiprock. When we departed the lodge heading to Goosenecks State Park, we anticipated about a two and a half hour drive. 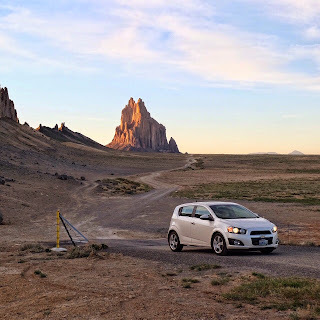 But for some reason I can't even begin to explain, we took a turn south out of Shiprock and almost made it to Gallup before we realized our mistake. Yeah. Not wanting to backtrack, I figured we could just turn around and take any one of the numerous left-hand turns off the highway and that would eventually hook up back up where we needed to be. In theory, that was a good plan. In actuality, it was not. I mean, it turned out okay, it's just that it didn't even cross my mind that in order to meet up with the highway we wanted to be on, we first had to cross a mountain pass that would put us above 10,000 feet and the snowline. On the one hand, it was kind of a grind to drive, but on the other, it was beautiful. Nonetheless, it put us a couple of hours behind schedule and added a whole bunch of unnecessary miles to our trip. Oh, well. Good thing we're retired. Uh, the altimeter says we are at 10,000 feet! We finally rolled into Goosenecks S.P and were met by Clarke. He gave us the lowdown on the available sites, and we picked the very one we were stopped in. If you had told me that I'd park 30 feet away from a 1,000 foot drop-off with a windstorm on the way, I'd have LOL’d. But that's exactly what we did. The winds were ferocious the first night, but calmed for the remainder of our stay. You can see Scoopy's proximity to the cliff edge. 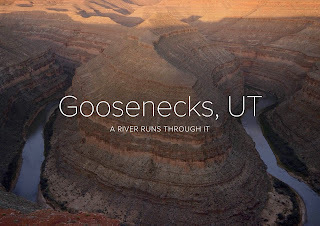 An aerial shot showing Goosenecks in the background. There were so many gorgeous views here! The light changed by the minute creating all sorts of drama. Steven was in photography heaven at Goosnecks. What a treat it was to see Clarke and Elaine again! 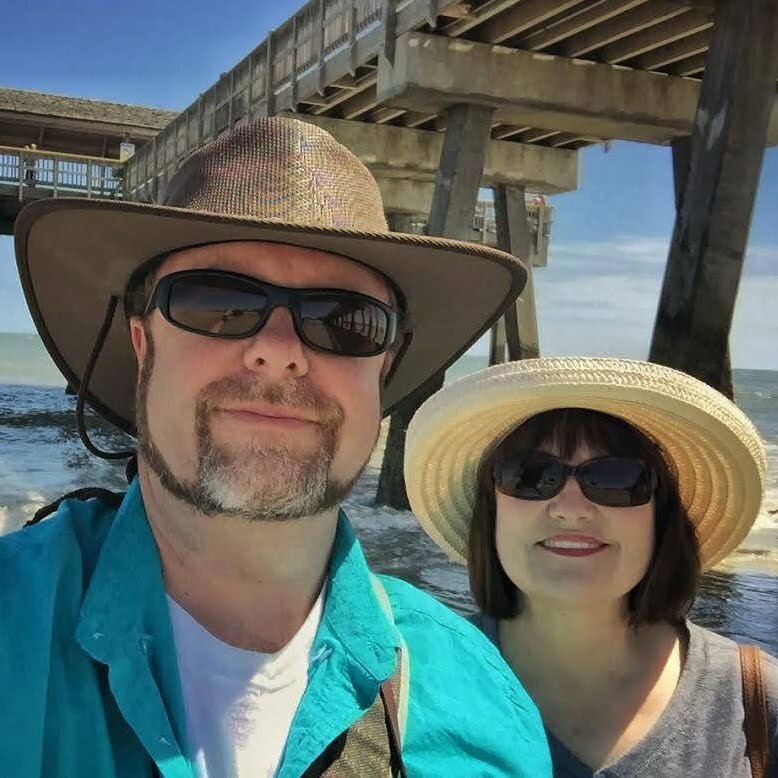 We first met them not long after we hit the road late last summer, when they were lighthouse hosts at Cape Blanco in Port Orford, OR. We just knew we would enjoy spending time with them and looked for that opportunity during our travels. They were on their way south for Elaine's dental appointment, but had two more days at Goosenecks SP. We were lucky to connect with them even for just a couple of days. We had a lot of fun yakking and eating (and drinking, of course) and generally enjoying each others company. We look forward to catching up with them again somewhere during our travels. Clarke and Elaine's setup at sunrise. The gang - together at last! 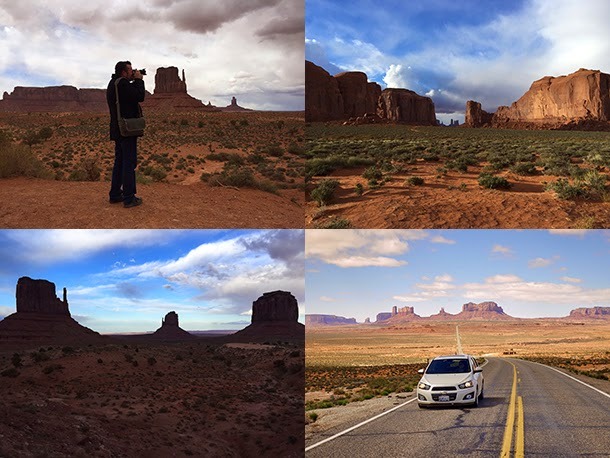 Some of the unforgettable sights in and around Monument Valley. We stayed only one more night after Clarke and Elaine departed, then made our way north. More on that in our next blog! Scoopy says goodbye to Clarke and Elaine. Twelve days. That's how long we had to travel before returning to the ranch for my final dental appointment rescheduled for April 9th. Looking at the map, our route was kind of obvious. With Live Oak Ranch being our center of all things, we had already traveled east, west and south. It was kind of a no-brainer for us to head north. So we did. A few miles south of Amarillo lies Palo Duro Canyon State Park, often called the "Grand Canyon of Texas" both for its size and for its dramatic geological features. It was on our original itinerary last fall, but somewhere along the way it got deleted. I can't even remember why, because it is definitely a place we were really looking forward to visiting. The campgrounds are located down in the canyon, none of this rim business. Steven unhooked Toadie so he could drive separately down the 10 percent grade to the bottom. Scoopy handled it well, and soon enough we were parked in our fabulous site deep in the Palo Duro Canyon. Our site was huge with lots of space to roam around.The weather was perfect. Warm days and cool nights, just the way we like it. Wheeee! 10% grade on the way down to the canyon. Our site at the Mesquite Campground. There are tons of great trails in the canyon and we made it our mission to do as many as possible. I hadn't been walking at all since that fateful day in the Davis Mountains, because just the force of gravity on my arms caused my joints to swell and pain to set in. Until my accident, I had been doing fairly well on getting in a good amount of steps each day, but boy did that stop instantly! Still, I managed a few good hikes and I was encouraged that my arms were healing properly. I thought for a while I might have to have them amputated. Caves and hills and trails, oh my! There was no shortage of activities here. Gotta love Texas in March! Steven shoots the canyon sunset. Lights, camera, action! The view of Scoopy from the top of one of the nearby hills. 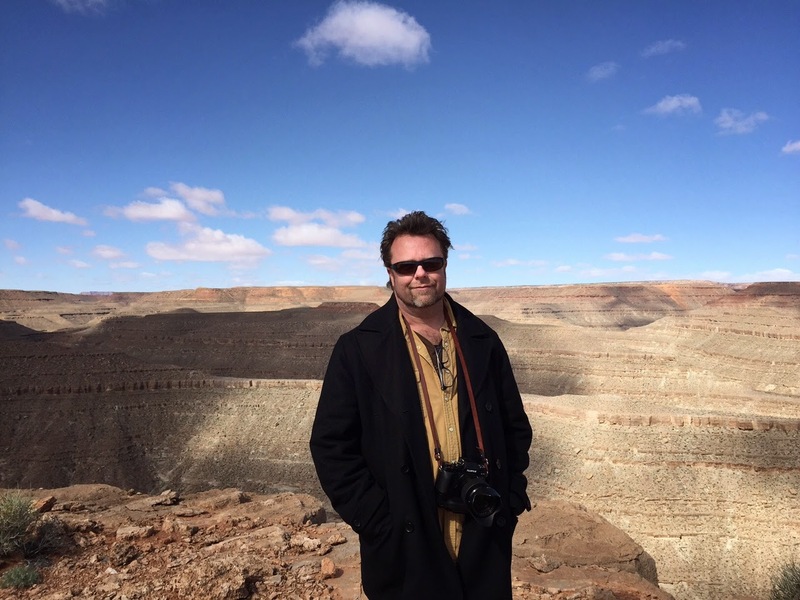 Steven created a beautiful photo blog of our time in Palo Duro, click on the image below to read. There were a few reasons we put El Reno on our travel schedule. First, I lived there when I was a kid, maybe second grade (?) and I wanted to check it out. Second, it is close enough for us to visit Oklahoma City without actually having to stay in the city. And three, I found a casino nearby that offered full hook-ups FOR FREE. Wait, not free. They gave us a $10 players card, so really, they paid us to stay there. How freakin' awesome is that?? Our free full hookup “campsite”. The casino all lit up for the night. Also, the thing about Oklahoma in early spring? Weather events. Yup, we experienced our very first scary weather event while staying at the casino. There was wind, rain and hail heading our way, and for the first time, Steven and I actually put together a Go-Bag. We've talked about it several times, but when you're sitting in beautiful, warm, sunny sky-type weather, putting together a bag of essentials is the last thing on your mind. But when push comes to shove, shoving crap into a bag is what you'll be doing, just like us. It was difficult to remember the kinds of things that make up the "essentials" pile, but we pretty much just grabbed what was important to us. All of Steven's camera gear, my purse, computers and phones. Cash and IDs. That's about it. We brought in the slides and sat around listening wide-eyed to the weather radio, looking at each other and both of us thinking we're all gonna die. Our neighbors said they were heading into the casino, so we finally decided to do the same. We got soaked just running to the car, which was about 20 feet from Scoopy, and we drove across the parking lot to the front door. We got even more soaked making a mad dash for the Casino entrance. We stood at the security desk watching the storm on TV. Once our county was given the all clear, we headed back to Scoopy. The danger may have passed, but the storm was still raging. We left the slides in and tried to sleep. A beautiful sunset just before chaos struck! Meanwhile, Steven checks his email while waiting out the storm. We ditched all our sightseeing plans in Oklahoma City and opted instead to go to Camping World and then eat Mexican food. Considering how exhausted we were, it turned out to be a good plan. Except, we purchased an outside rug -- our first! -- and after we paid for it we must have left it in the cart in the parking lot, because we have never seen that sucker again. Wow, what a beautiful state park! The camping is first come, first served and we snagged a wonderful site and luckily, we had beautiful weather for our stay at Lake Murray. There were quite a few families taking advantage of the weather and the three-day Good Friday/Easter weekend. Scoopy is happy to be by the water again. The beach and nearby trail where spring was in full bloom at Lake Murray State Park. Tara, who lives in San Diego, was on spring break and decided some time with Mom and Dad was just what she needed. We often wondered what we'd do if one of our kids wanted to "come home" over a school break, and now we know. She flew into Oklahoma City, where Steven retrieved her and brought her back to Lake Murray S.P. She settled in on the sofa and that was that. The three of us had a great time exploring the park, and it was good to have her "home", even if only for a week. Tara made herself comfortable in Scoopy. Daddy and daughter. On departure day, we just about had everything tucked away in preparation for moving our home down the road and had the engine going when Scoopy decided that something was not right. Her engine alarm began to screech and she promptly shut down. Hmmmm. This was a first, and we weren't quite sure what we were dealing with. The only message I could see what "low water". Hmmmmmm. What does THAT mean??? Out came the manuals. Nothing. Phone call to Cummins. Closed. Steven called Odel. Some advice, a visit to Walmart and a gallon of coolant later, Scoopy decided she was ready to go. While we were traveling 160 miles to the Coffee Creek Campground in Santo, we were on high alert for engine problems. Thankfully, Scoopy seemed satisfied for the time being. Apparently there are just a few instances that will cause her engine alarm to sound, which then gives us 60 seconds notice that she is shutting down. Low coolant is one of them, and that's what we experienced. We discussed at length how lucky we were not to have been careening down the highway when Scoopy decided to shut down. We would have been freaked out if that alarm had sounded and would not have had a clue what was happening or what we should be doing. At least now we know to keep our wits about us and try to get to a safe place in 60 seconds. It's also really nice to know that Scoopy is capable of protecting her engine, because god knows we aren't. But we're learning. A word about Coffee Creek Campground . . . what's with all the great reviews? 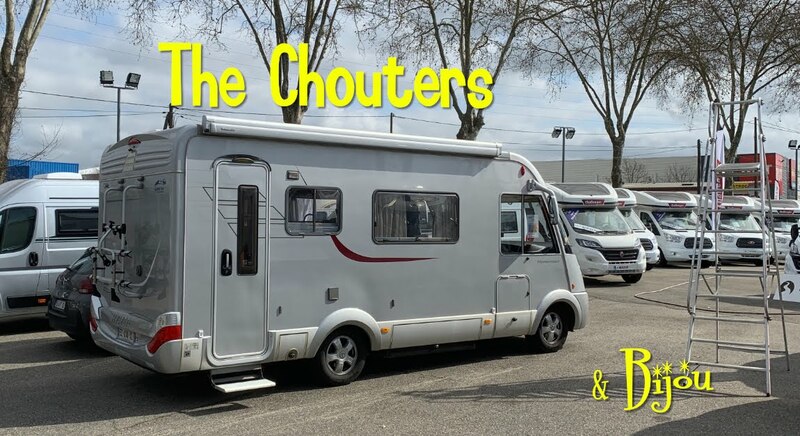 How does this place rate a 9.3 on RV Park Reviews? I mean, there is absolutely nothing wrong with it, but there is nothing spectacular about it either. What am I missing? Scoopy at Coffee Creek Campground and a pretty sunset by the entrance. Tara and Steven cool their heels. Bluebonnets were in bloom all around the campground. Anyway, I picked this place because it was the closest campground to my sister Shannon. She and J.P live on an amazing place out in the country, and we went out to visit them and meet "Shannon's Latte", the latest addition to their horse family. Latte arrived three weeks early, so it was touch and go there for a while. But when we saw her, she seemed healthy. She sure was feisty, not to mention adorable. Shannon’s Latte is a feisty one. Tara tries to be a horse whisperer. We spent a lovely evening with Shannon and J.P., and the following day they took us on a tour of the area, the highlight of which was the Baker Hotel in Mineral Wells. 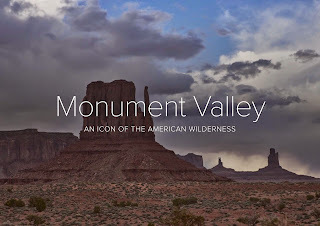 Steven put together two photo stories about these places, you should check them out by clicking on the two images below. JP teaches Tara how to ride a horse and she shows “Ducky” her gratitude at the end of the lesson! Steven makes a new friend. The gang out on a sightseeing trip to Palo Pinto. We thoroughly enjoyed our visit and were so happy to get to meet the new addition to the horse family. And, speaking of new additions to the family, a few days after we left, Shannon and JP got married! Congratulations, you guys! Before we left to head back to Live Oak Ranch, we checked Scoopy's coolant level and decided we'd be safer to call a mobile RV guy out to take a look. There was no engine alarm and Scoopy seemed happy enough to head out, but the coolant reservoir was empty and we needed to know why. The mobile repair guys came out and it took them about 30 seconds to diagnosis our problem. The mobile repair guys try to figure out the problem while Steven supervises. Though there actually was coolant (we were looking at the overflow . . . who knew?) there was also a leak that required replacing the water pump. They called around to every place within 70 miles of Santo but could not locate the exact part we needed. So they gave us the part number, filled the reservoir with water and sent us on our way. We were a bit concerned that he used regular water, but he said using coolant would just be a waste and that we'd be fine on the road. He was right, we made it just fine without screeching alarms and warnings. YAY! This would be our last stop at the ranch until next fall, and as much as we truly enjoyed it, we were chomping at the bit to hit the open road. We didn’t stay long.